In 1986 Omaha, Nebraska, Eleanor Douglas has just returned to living with her family. Her home life is still miserable because of her abusive stepfather, and, as the new girl at school, Eleanor is almost instantly subjected to ridicule. Park Sheridan begrudgingly offers her the seat next to him on the school bus, a moment that proves to be significant for both of them. Soon Eleanor is secretly reading Park’s comic books over his shoulder; this then leads the two to talking about comics and music, conversations that become essential parts of their daily lives. I feel like this review needs some kind of disclaimer (yep, it’s going to be that kind of review), so here goes. This is the toughest review I’ve had to write so far. It’s going to be rambling, for which I apologize in advance; I’ve been trying to organize my thoughts for over a week, and it’s just not happening. Normally when I finish a book, I have a rough idea of the points I want to cover in the review, but with Eleanor & Park, I don’t know where to start. Before I attempt to articulate why this book didn’t work for me, I also feel the need to disclose that realistic fiction is the genre that I read the least often. I usually read for escapism, and though realistic fiction is still fiction, most of the time I prefer to read about a world that’s far removed from this one. So why do I still bother with the genre, then? I have had the occasional success with it, and I worry that cutting it off completely would mean missing out on some great books. It’s just a matter of finding the ones that are right for me. Sadly, Eleanor & Park was not one of them. I first became interested in the book after it seemed like everyone was reading it, and if you look at the reviews, a slew of them are five star. I took a particular interest in this book when I found out that Park was half-Korean, the son of a Korean mother and a Caucasian father. While our situations aren’t quite the same (I was born in Seoul and adopted when I was four months old; my mom was of Irish descent, my dad of Irish and German descent), I was still very curious to read about Park’s experiences growing up in an interracial family. I don’t know if I went into the book with subconscious expectations of how Park’s heritage would be explored, but to me, it was a subject that wasn’t probed nearly deeply enough. In fact, the portrayal of his whole family was one of the stumbling blocks that I encountered while reading this. Park senses a distance between him and his father, and he wonders if it’s because he inherited more of his features from his mother than his brother, Josh, did. Now, Park also says that his parents are madly in love with each other. If Park’s dad is madly in love with his Korean wife, why would it matter if his son takes after her in appearance? I’m missing something here. There’s also zero backstory about how Park’s parents met other than that his father was in the military and stationed in Korea, and Park’s mother conveniently doesn’t talk about her life there. It’s as if she had no life until she married Park’s dad, came to America, had two kids, and started doing hair and nails out of her garage. I found this image one-dimensional and unsettling. As a character, Park didn’t strike me as one of substance. Aside from his occasional identity issues, there wasn’t much else to him. He alternates between pondering his looks and mooning over Eleanor. I did want to scream at him when he asked Eleanor, this girl whom he’s supposed to be absolutely, completely in love with, if she was the one scrawling lewd graffiti on her own textbooks. What?! When she suggests that it might be Tina, one of the girls at school who’s been bullying her, Park sticks up for Tina. He was so clueless at times about how hellish Eleanor’s life was, especially at home. I wasn’t fond of Eleanor, either. Personality-wise, she wasn’t the type of character I could connect with, but I also really didn’t like the way she saw Park sometimes—as Asian first, as Park second. Before she knew his name, he was “that Asian kid.” Even after these two are supposed to be madly in love with each other (which I didn’t buy, and the romance in general was too sappy for my liking), she still makes the offhand remark about his appearance, not in a mocking way, but it’s like this is the first thing she notices about him. If this was meant to reinforce how lacking in ethnic diversity Eleanor and Park’s neighborhood was, I don’t think this was necessarily the best way to go about doing so. There was a lot of potential here to examine why Eleanor thinks and says some of the things she does, but there’s hardly any follow-through. I get all nostalgic over the 80’s, and the geek in me appreciated the X-Men and Star Wars references. And I was ecstatic to see Elvis Costello and “Alison” name checked. All of this was not, however, sufficient to overcome the issues I had with the book, which also asked me to believe that these two characters were the 1986 equivalent of Romeo and Juliet. I’ve never considered the latter couple to be the paragon of adolescent love, so perhaps that was another reason why I had trouble with Eleanor & Park. Of course, there are many readers who loved this book, and I encourage you not to let my sole experience with it dissuade you from checking it out. If ever there was a book that I’d describe as a “try it for yourself and see how like it” read, it’s this one. To me, liking a book is always a matter of personal preference, and in this instance, the book and I ended up being wholly mismatched. When reviews for this first started pouring in, they were all so positive I immediately became wary. Then more started trickling in and they all commented on the slightly racist undertones, lurking behind the romance. Now I'm hella-confused about whether or not to pick this one up. Especially when I see bloggers, like you, who don't connect to the romance or the characters. I'd seen an overwhelming number of glowing reviews and some negatives here and there before reading this, so I didn't know what to expect going into the book, either. I don't go for the sugary sweet romances, and that's what this one felt like to me. And I was really uncomfortable with the depiction of Park's mother and Eleanor's perception of Park sometimes. But that's what I got out of it, and I think this is the kind of book where everyone is going to walk away with a different impression of it. Oh, wow! See, now I'm afraid to read this, because you and I tend to have very similar tastes when it comes to books. Your issues are ones that I could see potentially bothering me a lot, so ... hmm. I think I'll go into this one very cautiously. I try to go into every book I read with an open mind and not let any reviews I may have read sway me, but I had an extra personal interest in this one, and I feel like I was extra disappointed accordingly when the book didn't turn out to be my type of read. If you do decide to try it, I hope it works out better for you! I am sorry you didn't like it..I liked Eleanor and could relate to her lack of confidence..and remember what is was like being bullied at school for your clothes/weight. 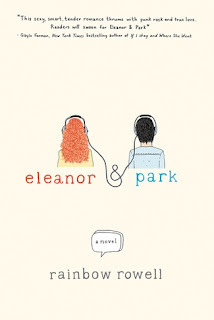 However reading this is giving me a different POV on the book and I thinking back on it Park isn't given as much depth as Eleanor. I did feel really bad for Eleanor because of what she went through at home and at school. Those girls were so awful to her, and then when Park defended one of them . . . that bothered me to no end. I do think that when you compare the two characters, Park ended up with much less dimension to his. Oh, Lee...you have no heart!! Just kidding! ;) I loved this book so much. But, I can concede your points. For me it totally wrapped me up in all those feel good 80's geek moments and turned me into a teenager again. Call me sappy if you must, it doesn't happen often but I do succumb on occasion. And that first hand holding....swoon! Sorry you didn't love it. I was quite shocked by how stereotypical her character seemed, at least to me. I also didn't like how the book suggested that assimilation into American culture made everything all right for her. The more I think about this book, the more things I find that don't sit well with me. hehe it's funny that you mention that: I've pretty much cut out all realistic fiction in the past years and I ALWAYS worry that I am missing out on fantastic books but I just can not motivate myself to pick said books up. I was very tempted to add this one to my reading list after EVERYONE seemed to be reading AND loving it...but I couldn't bring myself to add it on the shelf yet. Now reading your comments on how clueless Park seems and especially how the issue of race seemed to be handled (O.O)...it just makes me cringe. I won't be jumping of my boycott for this one, that's for sure! Nope, I don't think this is worth breaking a boycott of realistic fiction for. I did, however, recently have a positive reading experience with another very hyped YA contemporary, Pushing the Limits, and I really needed it in a way because my luck hasn't been so great with the genre lately. I didn't love this one either. I've felt pretty alone because there's so much gushing about it! I am looking forward to some of her other books, like Fangirl, though. I've seen Fangirl and Attachments around the blogosphere, and I'd like to give them a try. I hope they work out better than Eleanor & Park did.